Welcome to TGE Recipes, a place where our favorite bands share the secrets straight from their kitchens. Think your favorite Food Network show except on a purple blog. Today we welcome Kat Gardiner. Her new book Little Wonder is out on Father/Daughter Oct 5. Along with the recipe, you’ll also find a sneak peek of some writings from the book below. 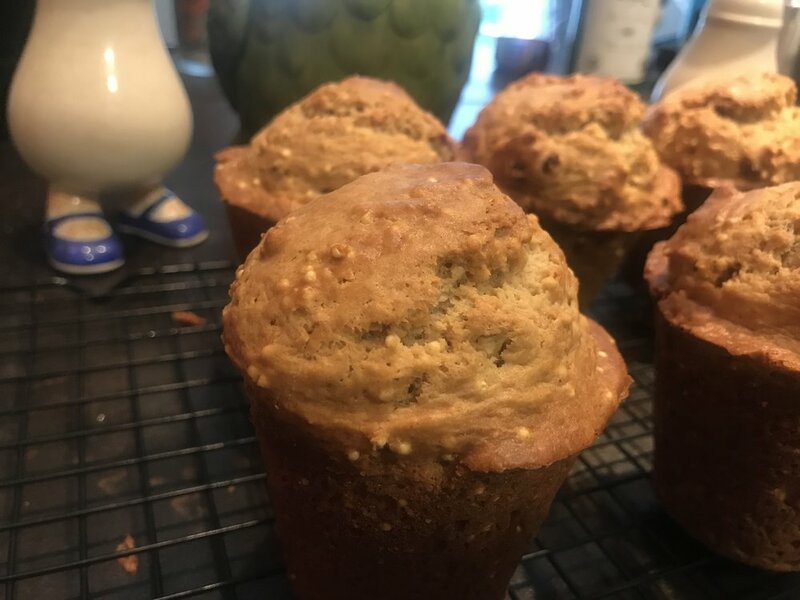 This is an adaptation of the millet pecan muffins found in The Cheese Board Collective Works by Alice Waters. These muffins taste like the first brisk morning of fall. I highly recommend taking one right out of the oven, slathering it with butter or jam, and enjoying outside with a cup of coffee, a sweater, and a good book. Let’s start with the butter. Cut the cold stick of butter into ½ inch cubes. Immediately stick those cubes back in the fridge. Cold butter is the most important part of getting light, pockety muffins. Preheat the oven to 375° with one rack in the middle and one on the bottom. Put a baking sheet on that bottom rung to catch any spill over. Now take the warm, room temperature butter and generously grease two popover tins. You want globs of butter in there, and make sure to get all the way into the corners. Set aside. Next, whisk your wet ingredients—the eggs, sour cream, milk, vanilla—together in a medium bowl. You want to make a completely smooth liquid. Set aside. If you have a food processer, put in the dough blade. If not, get out a big bowl. Sift the flour, baking soda, baking powder and cinnamon into your vessel. I use a mesh colander for this, and, to be honest, this step isn’t entirely necessary, but it does make for better muffins. Add the white sugar, brown sugar and millet to the flour mixture. Stir or pulse to combine. Add in the nuts and fruit. Stir again. Cut in the cold butter. This can be done in the food processer by pulsing, or by hand with a pastry blender. You want to act quick. The less time that butter is out of the fridge the better. You also want to err on the side of under, rather than over processing. In the end, you want your mixture to have a cornmeal consistency with little dottings of butter still visible. If you are making this ahead of baking, now is the time to stop. Store the dry and wet mixtures separately and continue on when you are ready to go. The wet mix will keep for 2-3 days in the fridge, but do not freeze. The dry mix will keep for up to a week in the fridge, six months in the freezer. Transfer the dry mixture into large bowl if you were using the food processor. Dig a well in the middle, and pour your wet ingredients into the center. With a wooden spoon or spatula, gently fold the mixture together. Again, err on the side of under, rather than over stirring. You want the batter to be just barely combined in the end. There should still be some noticeably wetter and drier patches. Using a tablespoon or something akin, divide the batter into the buttered popover tins. The batter to come up to where the tins start to fan out. Under, rather than over fill here. These muffins will rise and you don’t want them to drip over the edge. Put both tins on the middle rack (if they don’t fit, but one rack in your fridge until the first batch is out). Bake for 30-35 minutes, rotating once, until a toothpick inserted in the center comes out clean. Let cool in the tin on a wire rack for 10 minutes before unmolding the muffins to cool further. Now’s the perfect time to eat them, though, IMO. Tear in half and top with a generous slab of butter and/or jam. Drink some coffee . Enjoy.